Shawnee Press. Educational, Collection, Olympics, Teacher Resource, Games/Activities, Reproducible, Children, Choral Resources, History. 48 pages. Shawnee Press #M0751. Published by Shawnee Press (HL.35016005). ISBN 1592352006. 7.5x10.75 inches. Todd Schreiber/Valerie Lippoldt Mack. 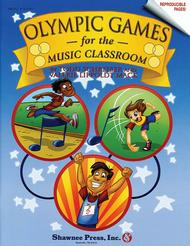 This collection of musical games with an Olympic theme has been created by music educator Todd Schreiber and Valerie Lippoldt Mack and is sure to be an Olympic hit with your students. This collection can be used for one grade level or the entire school over the course of an academic year. Your class will establish their country for the Olympic Games, then create their own Olympic flags, team colors and choose a team sponsor. At the sound of the starting pistol, the competition will begin to teach rhythm-reading, note values, rest values, note names, and solfege, along with movement games that teach listening skills through physical fun. The book is reproducible with variations to each game and contains instructional ideas for creating game boards that can be used year after year. 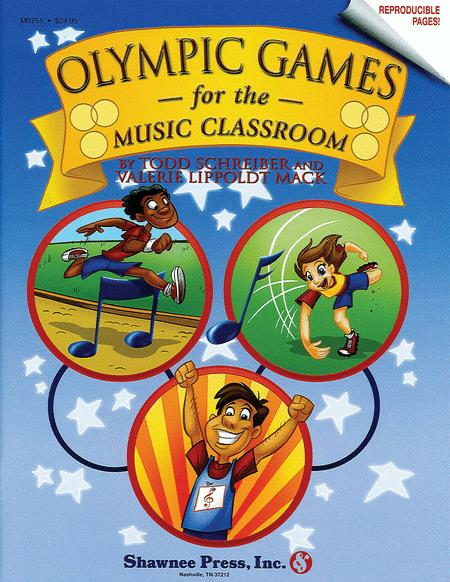 Whether it is an Olympic year or not, your music classroom will always be an Olympic musical winner with Olympic Games for the Music Classroom. Grades K-6.